Saint Patrick Catholic Church and School supports the Loyola Jesuit Secondary School (LJSS) in Malawi, Africa. Joyful and grateful greetings from Malawi! Indeed, this is letter we’ve been very eager to send you for the past many months. Why? It is because we can finally show you the wonderful event of the opening of Loyola Jesuit Secondary School (LJSS) in Kasungu. And you are responsible for this wonderful event, making it possible through your prayers and encouragement, your contributions and suggestions. On September 7, 2015, 144 girls and boys arrived as boarders at LJSS, to begin Form One (Grade Nine). This is our first class for a fine education in the best of our Jesuit traditions. Please look carefully at the photos and the smiles of the children in their new surroundings. It is you they are smiling at – for assisting them in different ways to begin their LJSS education. My Jesuit companions of LJSS – Fr. Simon Makuru, Head Teacher, Fr. Ken Simalalo, Chaplain, Fr. Alojz Podgrajsek, Project Manager, join me, Development Director, with prayers of appreciation for your consistent help. Please keep us and all our teachers, staff and students in your thoughts and prayers! We will keep you informed of our progress and hopes. For regular updates Like our Facebook page and bookmark our website! Every best wish and blessings for you and all those close to you! Photos of the first day of school at LJSS share the joy of the 144 boys and girls who arrived to begin 9th grade and to be the first class of students in the newly built building— the first Jesuit school for secondary education in Malawi, Africa. Father Peter exclaimed that he has “plenty of reason to smile, especially remembering the generosity of St. Patrick’s parishioners that help make all this possible. I still feel the graced strength of that Irish blessing [he received at Mass on July 26, 2015 before his return trip to Africa]! 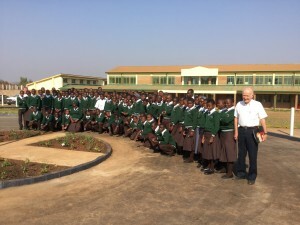 The Foreign Missions ministry at Saint Patrick Catholic Church provides financial support to three other missions in addition to the Loyola Jesuit Secondary School in Malawi, Africa.